In 2016 collector Thomas Ewing shared with us the only known photo from Hardeen's 1937 Vitaphone short, Medium Well Done. Now Tom is back with a new image that's even more exciting! This photo shows Hardeen giving spiritualist demonstrations before members of the cast, including Gertrude Mudge, Margaret Breen, and Paul E. Burns. Of note is what appears to be a large spirit cabinet. What's interesting is we know Harry Kellar gave Houdini his spirit cabinet in 1917. Presumably, Hardeen inherited it along with Houdini's other apparatus. So are we seeing Kellar's own spirit cabinet being performed here? Also, is that Jim Collins holding the door? Medium Well Done features Hardeen as a detective exposing the tricks of a bogus medium. 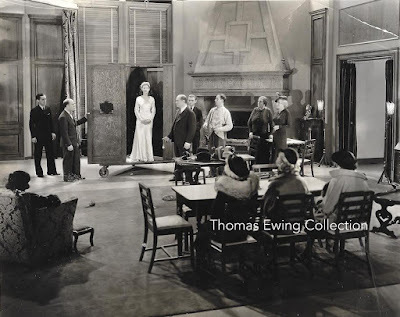 It was shot at the Brooklyn Vitaphone Studios in January 1936 and released March 6, 1937. At the moment, it is considered a lost film. But the good folks at The Vitaphone Project have made it their mission to find lost Vitaphone shorts, so here's hoping one day they might uncover this important piece of movie and magic history. Thanks to Tom Ewing for letting me share this treasure here. UPDATE: According to Ron Hutchinson at The Vitaphone Project Facebook group, Medium Well Done is NOT lost. He says it "exists in 35mm at Library of Congress." This is great news, and it gives me hope we might one day see it released via the Warner Archive Collection. Excellent! Thanks for sharing this photo and the news about the film. I'd say that is Jim Collins. If this is the case, the Library of congress can screen prints on appointment of material in their holdings at the Moving image research center in Washington. This is the only way to see Star Wars as it was originally shown back in '77. BTW, I've had the date wrong on this. While it was made in 1936, it wasn't released until 1937. I've changed all. According to Dean, Kellar's original Spirit Cabinet went to Thurston. If the cabinet in the Medium Well Done photo was Harry's, it was the newer one Kellar had custom made for that Hippodrome fundraiser show in 1917. I wouldn't be surprised if Houdini had paid to have the new cabinet made and Kellar decided to let Harry keep it. Yeah, it says in Dean's article (linked in post) that Kellar gave HH the newer cabinet. Interesting idea that HH had it made just for the benefit. Could be. Also, Kellar had many Spirit Cabinets. When he toured Mexico and South America, a new one was made for every city, they left the others behind because they were too bulky to travel with. And yes, Houdini got the spirit cabinet that Kellar used at his final show that was that big benefit show where he came out of retirement. Oh, wow, Dean, you are the Magic Detective indeed! This sure does resemble the photo you have of Maro's Mystery of Aryan illusion. I didn't remember your post, but it is great stuff! So maybe this is the Mystery of Aryan, purchased by HH, passed to Hardeen, and being used here as a spirit cabinet just as you say it can. Or whatever Hardeen is doing. Guess we won't really know until we see the movie. An interesting tidbit from Bill Rauscher's book Hardeen: Monarch of Miracles. Hardeen allowed Frederick Eugene Powell to use the Keller Spirit Cabinet in February 1928. Powell performed with the cabinet for an SAM testimonial honoring him.